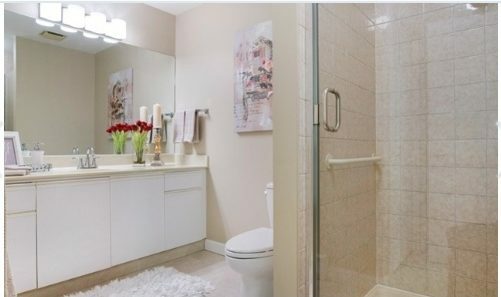 Above is the listing photo of our main bathroom in our little nugget of a downsize. Its pretty good, fresh, bright and perfectly fine. If you like beige that is. If you remember we had almost the whole place painted white when we moved in, with the kitchen and office in black. 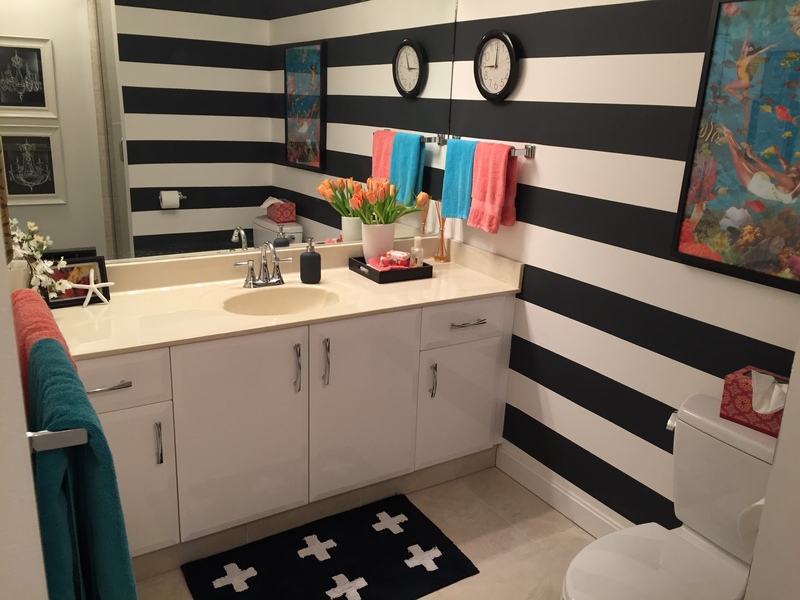 We had Renuit Cabinet Refacing come in and reface both the kitchen and bathroom cabinets. Below you can see the new doors and white walls. Unfortunately I am not a particularly rich woman, and the faux marble counter with lovely seashell sink have to stay. For now. I have all kinds of fun projects I’ve been dying to get to, but we’ve been having some ridiculously bad weather hit here and all my spray painting or transporting of large items are on hold until this town gets it’s usual balmy weather back in line. I am waiting with absolutely no patience. We moved here because snow might come but probably won’t and it never stays. It has locked itself in for about 3 weeks now and I am getting the DIY withdrawals in a very bad way. 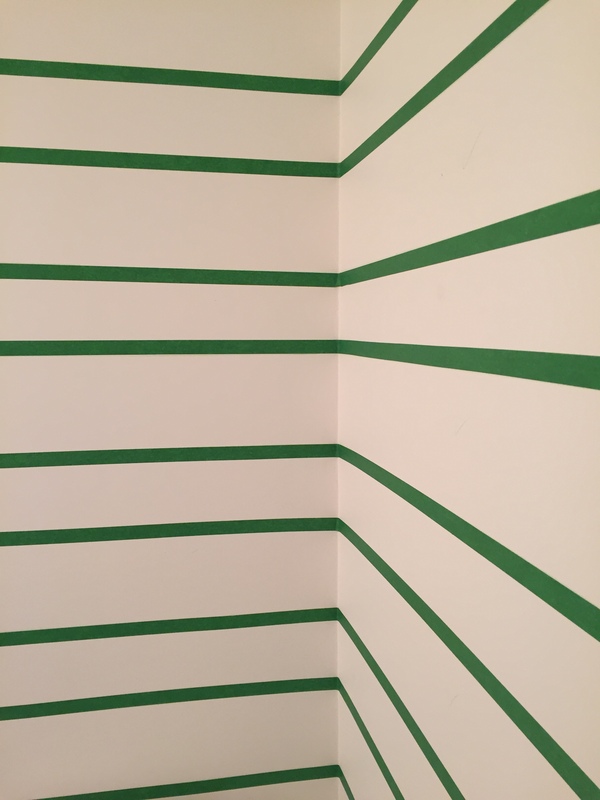 This project fit the bill while I wait even though I ran out of painter’s tape about 3/4’s of the way in and it was too miserable out to get more. We are totally unprepared to have this last this long here in the west coast. BUT! Never surrender!! So with ladder and level ruler in hand I gather up what I have and go forth anyway. 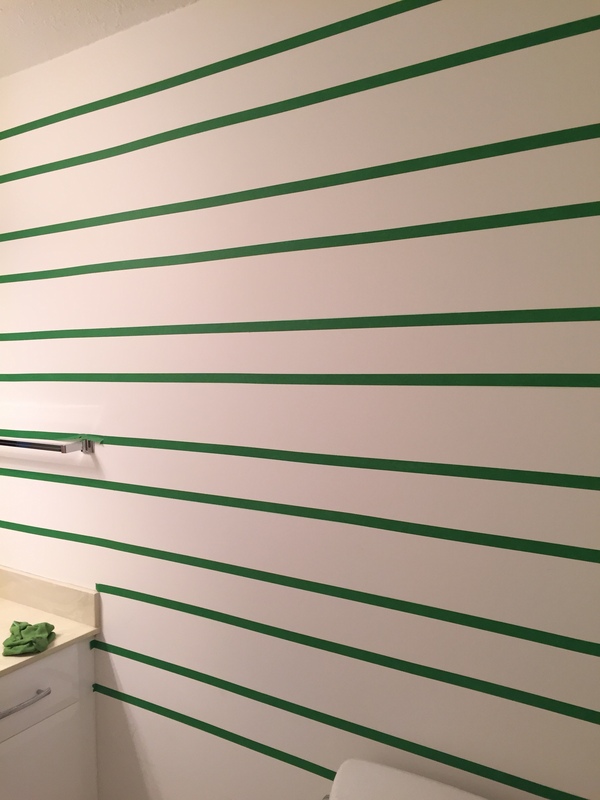 I measured the height of the wall and divided that number to make a decent size stripe ratio. I drew the stripes out with a watercolour pencil which wipes off with a damp cloth easily when I’m done if there is any left not covered by the paint. There usually is some. Ok, there always is some. I’m not a robot, people. I also checkmark every stripe I am going to paint since it’s easy for me to get confused about what’s what. I taped off the stripes and where this picture above ends is where I ran out of tape. No panic necessary, I’ll explain in a bit. I also went back to tape the ceiling line since it was very crooked and popcorny. That’s a word. 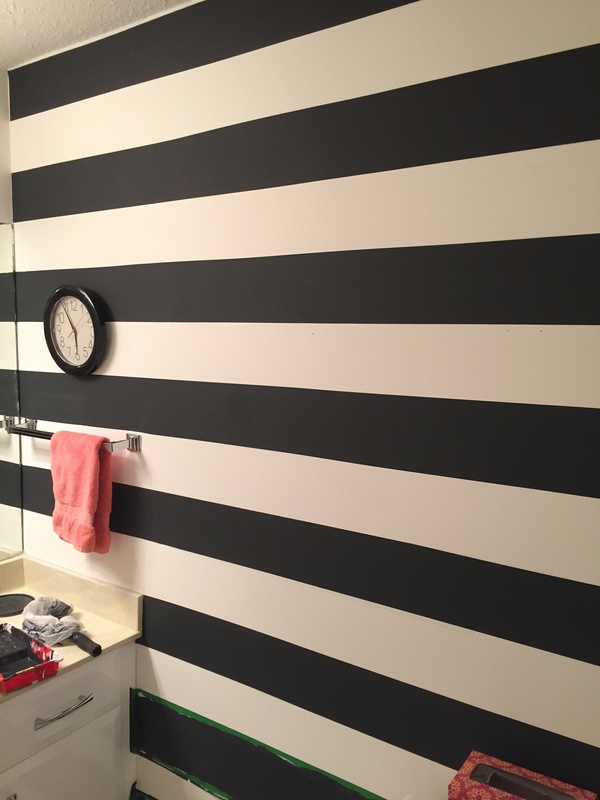 The next picture is probably the most important tip you are ever going to hear about painting stripes. I know I have talked about this before, but there are new followers since I last did a crisp line and anyway it bears repeating. Notice how my green tape on the inner edge has a swipe of white on it? That’s the secret trick. 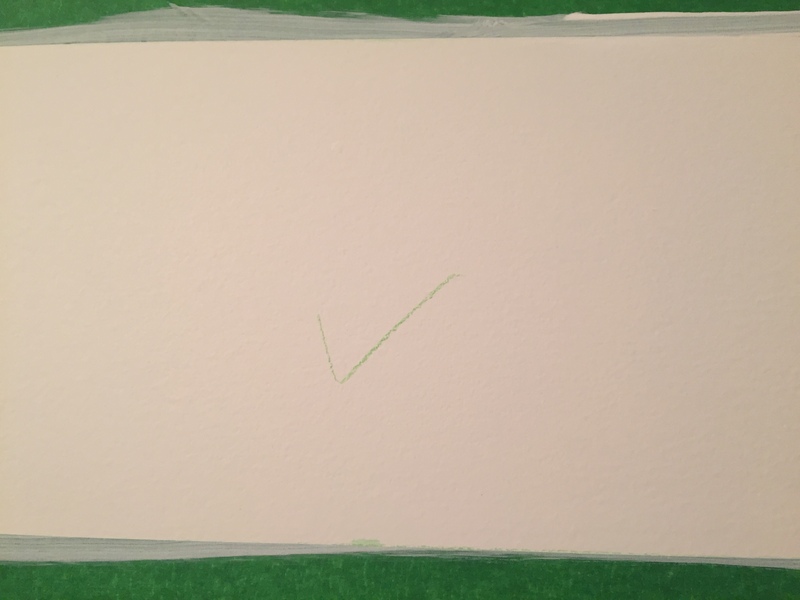 If you paint the edge of the tape with the original wall colour, it bleeds under the tape and seals the edge. The next colour you paint will now not bleed under and you will have the sharpest line known in the painting world. Promise. See below? The next picture shows first, the little white space I left between the popcorn and the start of the black stripe. And secondly you can see I only have tape on the bottom of the wall. That’s where I had run out of tape originally. 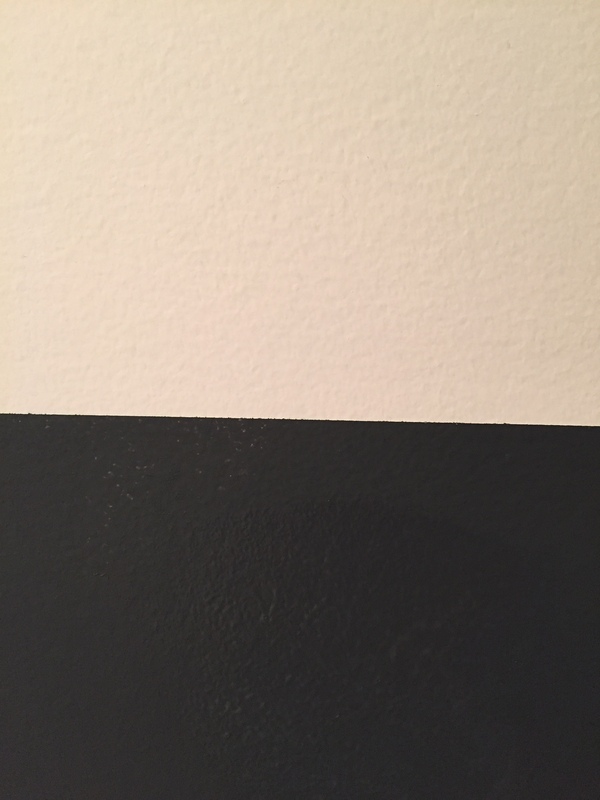 Once I painted my two coats of black on the upper portion of the wall, I peeled off the tape – always always always do this when the paint is not quite dry or it can peel off the paint if you leave it to dry first. Made that mistake when I was a virginal decorative artist. Only once. I then waited till the used tape was dry as well, to prevent transferring paint where I do not want it. Namely the walls but I’ve gotten it on my hands, hair and clothes. No joke. When you peel the tape off the wall, do so slowly so it doesn’t curl or attach itself to itself. The tape is toast if this happens. I hung each piece on the shower door while I waited. Of course I watched Netflix or something instead of watching the paint dry because we all know how boring that is. Once the tape dries, you can use it again, but I recommend using the edge that doesn’t already have paint on it if you can for running along the pencil line. I only did two walls, I thought it would be enough impact for one smallish room. This other side stayed white. Notice the beautiful artwork by my sister. 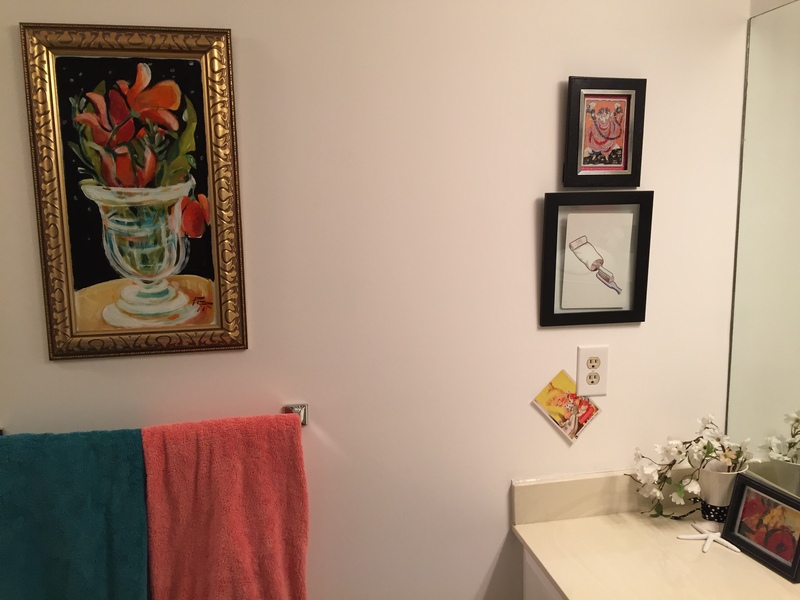 Yes, you can put real art in your bathroom. I don’t know about you, but I am digging the new look. Even daughter #3 who prefers whites and greys and golds in her domain gave me the thumbs up. Success!! And my favourite new thrift store find. A 2008 Ikea print that sums my style up pretty well, don’t you think? Previous Post No DIY, but still Interesting?? LOVE those stripes!! 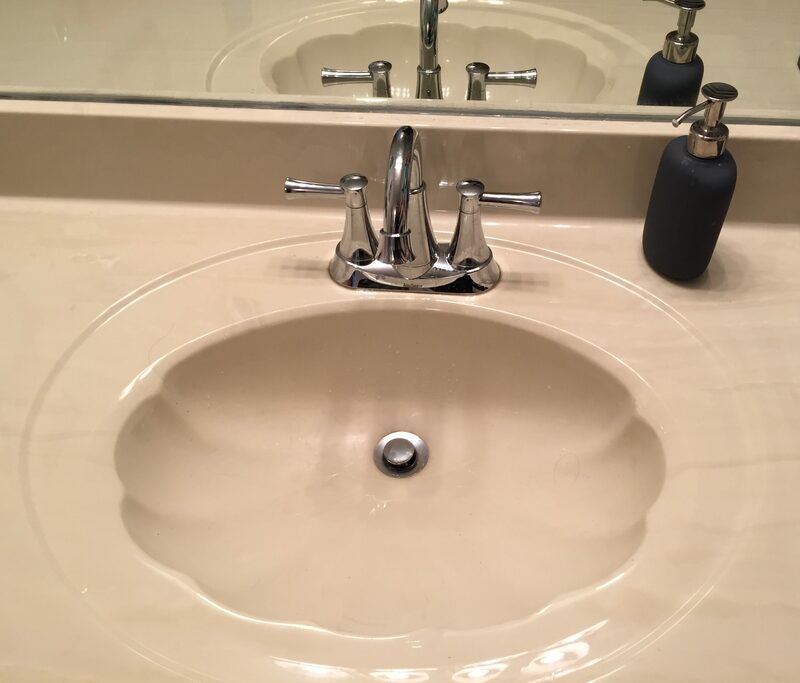 We had the SAME faux marble counter/shell sink combo and I had hoped never to see it again! We got a cheap rectangular sink at Lowes and bought a white formica counter at Ikea and in a few hours and a few bucks had a new bathroom. Do it… You’ll thank me! It’s gorgeous. I love how clever you are! You always make me FEEL clever when you say such kind things…thanks!! Could have fooled me. 🙄 I’m waaaaay too humanly flawed to do this. Back at the painting! And doing a stellar job, as always. 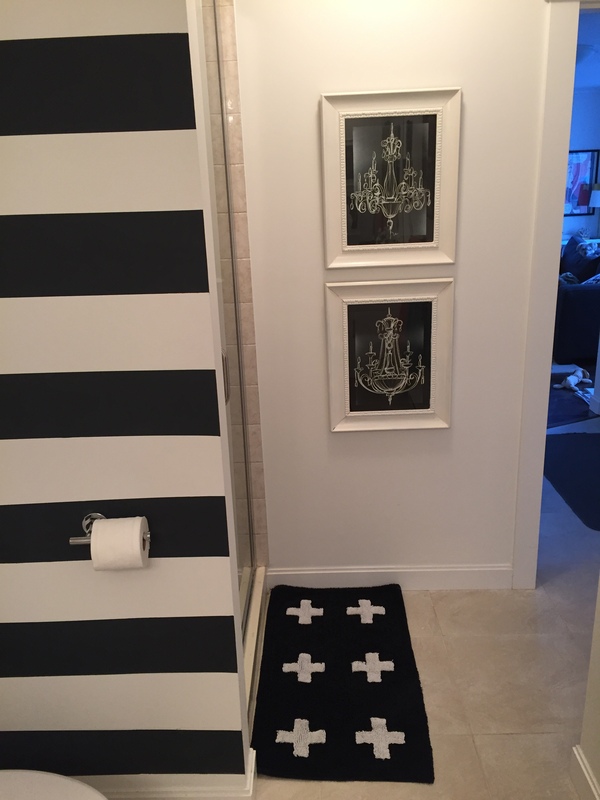 Great bathroom update! Yes, it felt good to pick up a brush again, thanks for the perfect comment to get me through the crummy weather we’ve been having! This looks fantastic and so effective. Well done. Right? $3.00 at our local thrift store. Kitschy goodness 💛 thanks for your comment! !